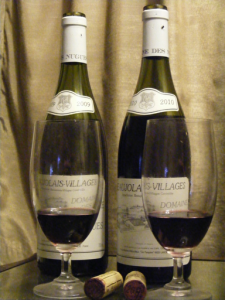 On the last shopping trip to the wine merchants I happened to find a bottle of 2009 Domaine des Nugues Beaujolais Villages among the 2010 bottles. The thing about Beaujolais is it’s rarely discounted in supermarkets so doesn’t feature in the outrageous 3 for a tenner discounts – so it’s always the wrong side of a fiver a bottle (usually closer to ten) and doesn’t look like good value. But here’s the rub – the discounted supermarket wines are not worth their alleged full price when compared with the likes of a decent Beaujolais. They’re worth the discounted price, that’s all (still good value if you want to make a nice coq au vin). The massive discounts and market presence of Australian wine in the UK has more to do with volume discounts and less to do with quality. But I’m a bit biased because I don’t really like new world wines much – too much alcohol and sugar and not enough acidity to cope with food. I do think you get what you pay for with wine and the unsexy French wine could actually represent better value for money, albeit at a higher cost per bottle.